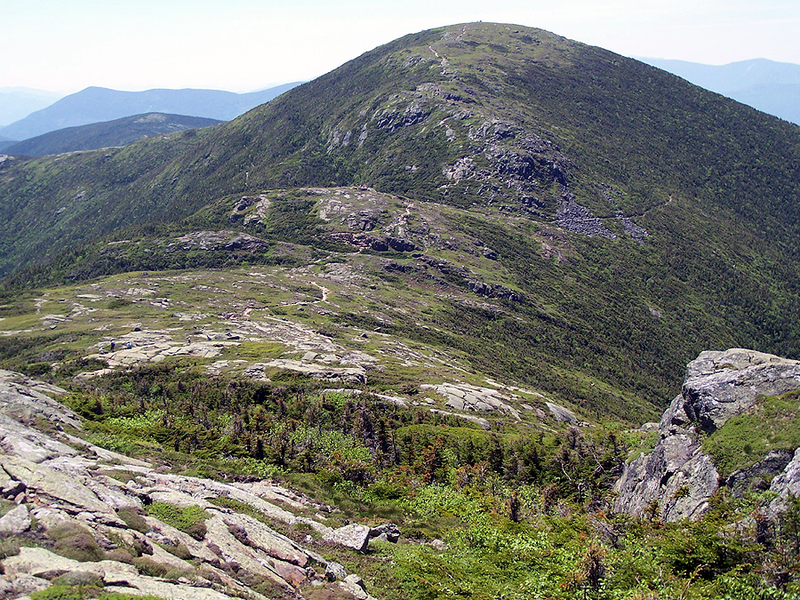 Mount Eisenhower (AKA Pleasant Dome) is a bald summit with a large cairn on top with magnificent 360 degree views. The Mount Eisenhower Loop Trail crosses the summit and can be reached via three trail the Edmands Path, Crawford Path, Mount Eisenhower Trail. the Edmands Path being the easiest and shortest, the Crawford Path a little longer and more exposed, and the longest is the Eisenhower Trail deep in the Dry River Wilderness. Approaches above treeline on the Crawford Path and Eisenhower Loop trail can be dangerous in bad weather, high wind, and low visibility. -Edmands Path / Eisenhower Loop: 3.3 miles, 2,750 feet. The Edmands Path trailhead is located on the Mount Clinton Road between Route 302 and Base Road. The trail has easy to moderate grades with ok to rougher footing higher up. The trail is well protected from the weather until the last section just below the Crawford Path. The Eisenhower Loop Trail has moderate grades but is exposed to the full force of weather and the wind. -Crawford Path / Eisenhower Loop: 4.7 miles, 3,100 feet. The Crawford Path has easy to moderate grades with very good footing until treeline where the trail becomes rockier and exposed to the weather for the the 1.2 miles to the Eisenhower Loop. -Dry River Trail / Mount Eisenhower Trail / Crawford Path / Eisenhower Loop: 8.5 miles, 3,840 feet. The Dry River and Mount Eisenhower Trail have easy to moderate grades but have very awful footing and views are limited until the final tenth of a mile to Crawford Path. The trails can be difficult to follow and are very lightly used. A perfect hike to escape hikers in the woods for several miles!